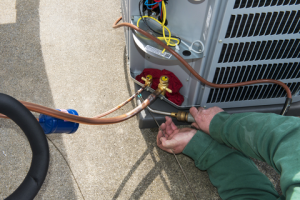 The summer season can become stressful to your HVAC system. An air conditioner can struggle because it is being used a whole lot more often than usual. This could make it easier for your system to wear out quickly. You might be more likely to require an HVAC repair service in the summer because of all these problems. The repairs that can take place during the summer can be especially varied. You should make sure you take a look at what an air conditioning expert can do for your AC system. Filters can be difficult to bear with as they will pick up lots of humid air during the summer. This can make it easier for a filter to clog up. However, you can hire a professional to help you replace your filter if necessary. This includes plans to clear out old components or to at least clean something out. This in turn will help you keep your space as clean and protected as possible. Ducts are often more likely to suffer from cracks and breaks in their seals during the summer season. The summer is a time when changes in air pressure can cause some ducts to expand or contract over time. The added humidity in the air during this period may only create more stress to the AC ducts. Therefore, they can break, crack or otherwise becoming misaligned. The ductwork in your home will have to be inspected through the support of an HVAC specialist. Many repairs will entail checks on all seals around your setup and a review of how air is moving around. This should give you an idea of how well your setup is working so you will have full control over the situation at large. How Is the Control Panel? The control panel in the air conditioner is often something that people take for granted. However, it is crucial to the success of any AC unit. It has to be wired properly and linked to your air conditioning unit to ensure that it gets the control signals you want to run with. In return, it will cool off your home the right way. A Dallas Plumbing Company HVAC professional may help with reviewing your control panel. The expert can review the panel based on its wiring setup and how it reacts to different conditions outside the home. Sensors and other components used to trigger the material can be used to keep it ready. The coils that are used in the HVAC unit will also have to be checked. This includes a look at the ways how the coils are arranged and if they are worn out or if there are any problems in your space. Be sure to see how an HVAC repair service can help you to keep your summer maintenance needs under control. You have to make sure that your setup is maintained well so it won’t be a hassle in any way. This entry was posted in HVAC Services and tagged HVAC Repair by admin. Bookmark the permalink.